Oh the most perfect Technique that I know of for Bright Bursts of Colour would have to be Joseph’s Coat. It’s quite easy to do and very effective. 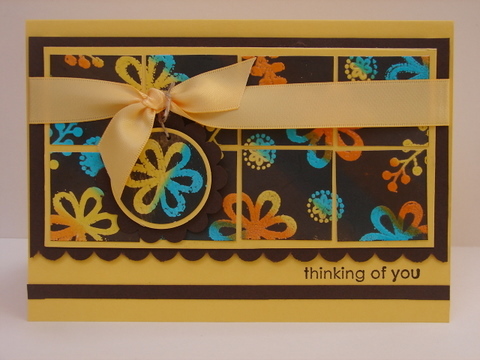 This is the card I put together for the JAI # 53 – Bright Bursts of Colour Challenge. To make this card I started by rubbing some Tempting Turquoise, Daffodil Delight and Pumpkin Pie Ink onto some glossy cards. 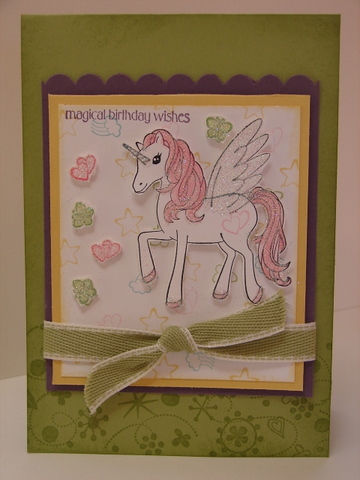 Then I stamped and embossed the images using Versa-mark Ink and Clear Embossing Powder. Using my Brayer and some Early Espresso Ink I covered the card totally and then rubbed off any excess ink to expose my Bursts of Colour. 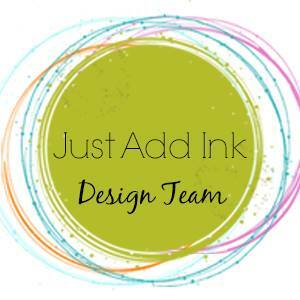 Click the link to have a go at the Just Add Ink Bright Burst of Colour Challenge or view the Design Team entries. You’ll receive a free Sale-A-Bration stamp set of your choice when you spend $100 on Stampin’ Up! products (before shipping and handling). 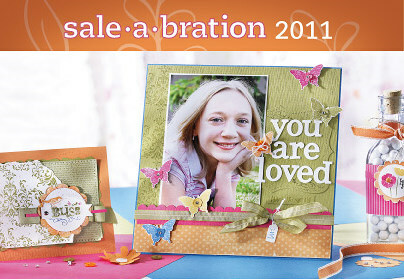 There’s no limit – so for every $100 you spend, you can select another FREE Sale-A-Bration stamp set! When you host a workshop of at least $600 (net sales before shipping and handling) you’ll receive a FREE Sale-A-Bration stamp set in addition to all of the regular hostess benefits! Anyone who joins Stampin’ Up, as a demonstrator can choose any stamp set – a value of up to $79.95-from the current Idea Book and Catalogue! Contact me today to take advantage of this fabulous promotion – Book a Sale-a-bration workshop with your Friends, Join Stampin’ Up or place your order. It’s Sketch Challenge Time at Just Add Ink. Here is the Sketch. Well I have to say – I struggled with this one a bit. I messed about and put together about 5 different things and finally came up with my card……although I then realised – that it’s kinda not like the Sketch at all! Whoops! But it does have some of the elements…sort of. Here it is…. 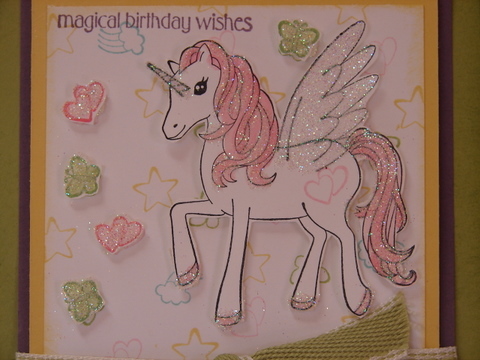 The best part of this card is actually the glitter – which you can’t see in this photo – so here is a close up. The Stamp Set is called Pony Party. 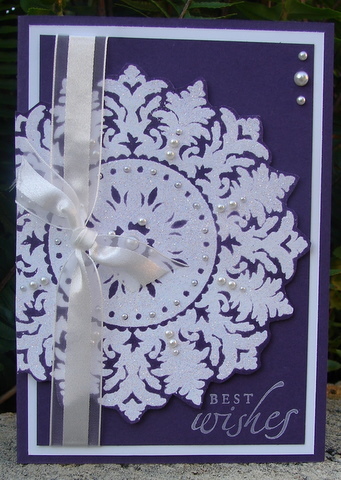 I’ve used Pear Pizzaz, Perfect Plum, So Saffron & Whisper White Card stock. 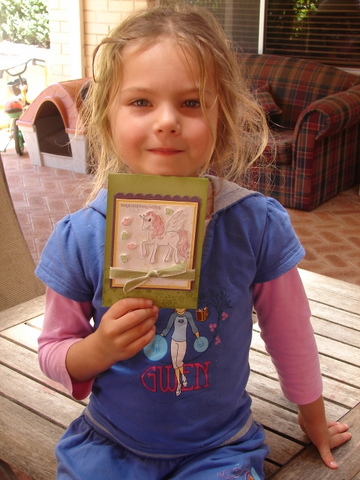 It’s such a girly stamp set – Sarah decided the card was her’s. So I had to take a pic of her with the card too. Monochromatic describes paintings, drawings, design, or photographs in one color or shades of one color. Monochromatic color schemes are derived from a single base hue, and extended using its shades, tones and tints (that is, a hue modified by the addition of black, gray (black + white) and white. As a result, the energy is more subtle and peaceful due to a lack of contrast of hue. Monochromatic color schemes may be considered boring unless there is diversity within the design. So this is what I came up with……. 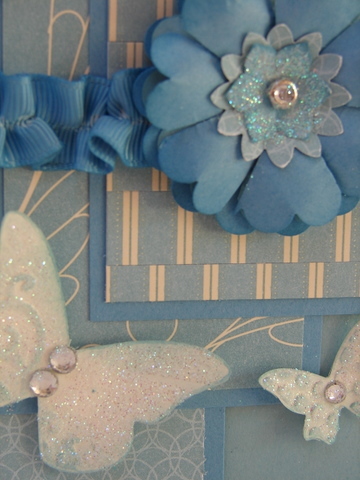 I’ve used Baja Breeze, Marina Mist, Very Vanilla and the Elegant Soiree Designer Series Papers. The Ribbon is the Marina Mist 5/8″ Grosgrain. 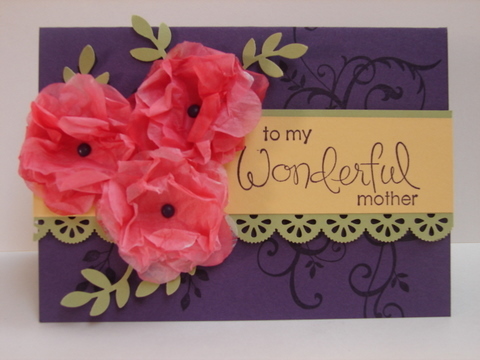 I used the Scalloped Circle and Boho Blossom Punches to make the flower. And the Butterflies are made with the Big Shot and the Beautiful Wings Die. My fav part was the Glitter and Diamante’s- that I added at the end and I think it really finishes it all off nicely. So go and check out the other Monochromatic Creations by the Just Add Ink Design Team. Then make up a project yourself and submit your entry too. Today we are off to a Birthday Party. My friends boy Kyle is going to be 9 – he is into Monsters and Aliens. 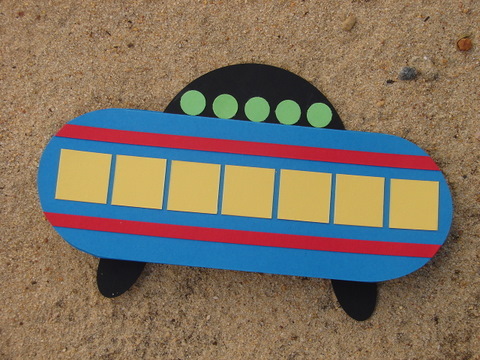 So I decided to make him a Space-ship card. It was quick and easy to put together. A bit of fun for the afternoon. I did it so both sides of the card are the same. 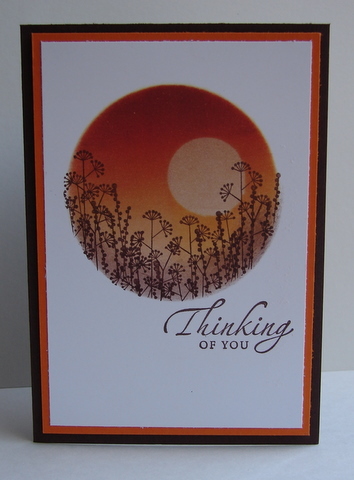 Have you heard about Aussie Cards for Sale, it is an Australian website specialising in Handmade Cards. They are looking for new designers to sell cards online – so I thought I would put my name in the hat. So here are 4 of my fav cards for them to consider. It’s Colour Challenge time at Just Add Ink this week. Here are the colours……. It just happens to be my Mum’s birthday tomorrow too – so I made this with her in mind. 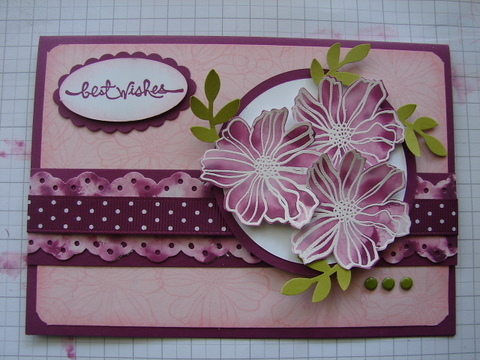 So I have used the Baroque Motifs and Wonderful Favourites Stamp Sets. I made these flowers with the Fancy Flower Punch and some tissue paper. So get your card, stamps & ink out and have a go. 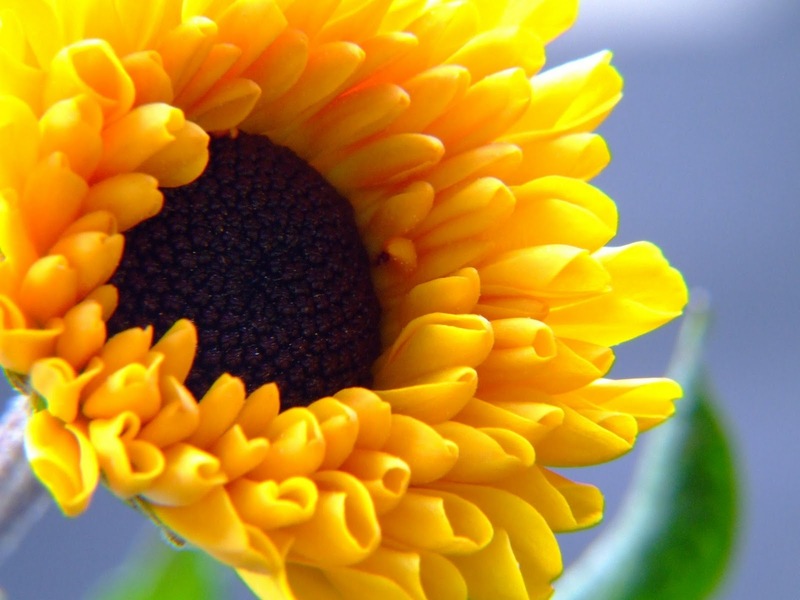 You can post your submission here on Just Add Ink.